The Spitfire F Mk XVI is a Rank IV British fighter with a battle rating of 4.7 (AB) and 5.0 (RB/SB). It was in the game since the start of the Open Beta Test prior to Update 1.29. 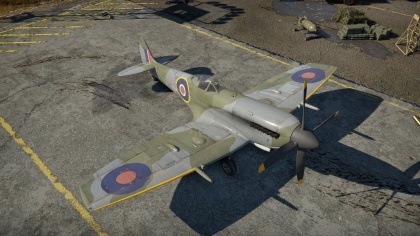 The Spitfire F Mk XVI is a very unique plane with an awkwardly unique role and design. 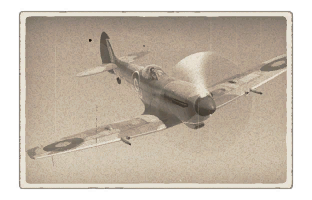 Virtually identical to the Spitfire LF Mk.IX, aside from the clipped wings, the Mk XVI combines the low-altitude capabilities of the aforementioned fighter with the fantastic roll, dive, and speed capabilities of the German Focke-Wulfe 190 series. The Mk XVI possesses all the characteristics of the LF Mk. IX regarding armament and performance at low-altitude. Low-altitude climb acceleration is fantastic, climb rate is very good, and armament is extremely effective. The main distinguishing feature of the XVI is its clipped wings. These wings give the Mk XVI some distinct advantages- a great roll rate and amazing dive and level speed and acceleration. The roll rate makes evasion a very easy task- rolling manoeuvres can easily evade most tail-end attacks by any fighter in the 4.5-5.5 BR range. Even more, the clipped wings of the XVI provide for very good low-altitude speed and acceleration performance- this fighter climbs like a rocket and dives like a hornet below 1500 m.
However, the clipped wings can provide some significant disadvantages to flying, as well. Compared to similar Merlin Spitfires the turn rate is far worse, higher-altitude performance is abysmal, and climb performance is worse, though marginally. Weaponry is standard, except for the 2 x Browning M2 12.7 mm HMGs that replace the standard 4 x Browning .303 machine guns. As a matter of fact, the two M2s provide a significant increase in fire power. When equipped with Omni or Stealth they provide excellent "soft" ground target dispatching performance while proving effective as a last-ditch weapon. As with most of the Spitfire line, the XVI possesses 2 x Hispano-Suiza Mk.II 20 mm cannons which are highly effective against most fighters, especially when utilizing the "Air Targets" belt. Thus, the Spit F Mk. XVI is not a suitable Boom & Zoom nor high-altitude fighter; it works best as a low-altitude fighter-bomber that can effectively take out ground targets while providing good fighter cover. Boom and Run is by far the best recommended tactic. This page was last edited on 8 December 2018, at 01:23.